Buckle up for piles of pictures! 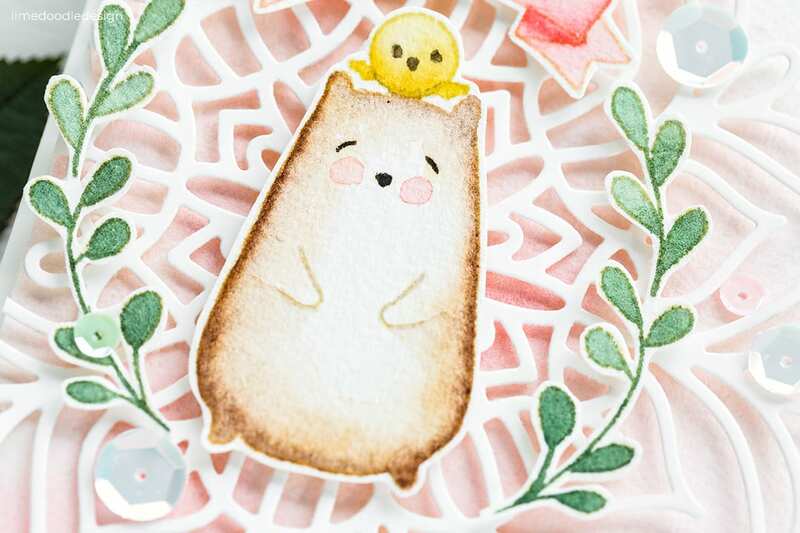 Today’s post is part of a blog hop to look at the new release from Waffle Flower Crafts which includes original products for swatching and colour exploration. 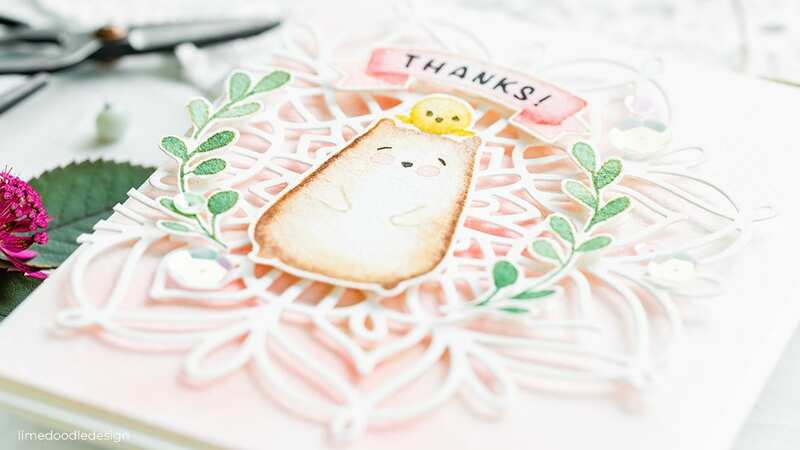 I’ll be detailing my favourites below, but if that isn’t your thing then skip down this post a little to a card I made using the new Lacy Flower XL die and the adorable Big Bear & Bird set. I’ve linked all supplies at the end of this post. Compensated affiliate links used. The new colour swatches sets from Waffle Flower are ingenious and fill a hole in the market not just for cardmakers but any artist wanting to swatch and explore colour be it watercolours (tube, pan, liquid, Distress Inks), Copic markers, Zig Clean Brush Markers, pencils … you name it these new sets have so many possibilities to catalog and explore colour media. 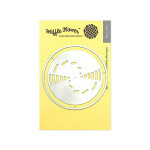 “This is a back to basics release focuses on the function of stamps and dies. Our goal is to help beginners gaining confidence over a colouring medium and to help experienced colourers warming up and learning more about their media. 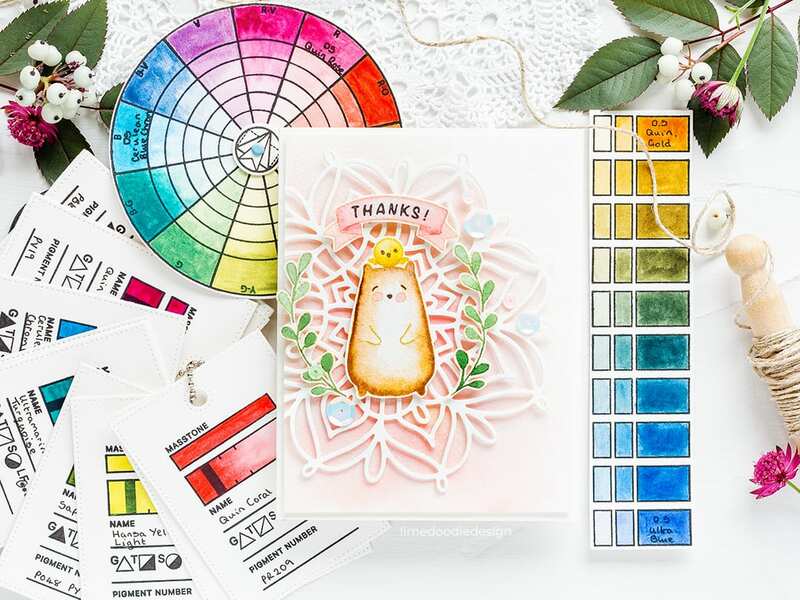 Colour Swatches (stamp, die, combo) is a great all-around swatching set while Color Wheels (stamp, die, combo) helps you create the most accurate colour-mixing references with the supplies you have on hand. 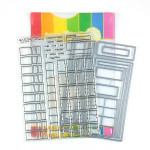 The 2”x3” Swatch Stamp Set is adapted from Color Swatches stamp set for quick-n-easy applications and storage. Swatch Tag Die contains a standard ATC size tag (2-1/2” x 3-1/2”) with piercing details and hole re-enforcers. 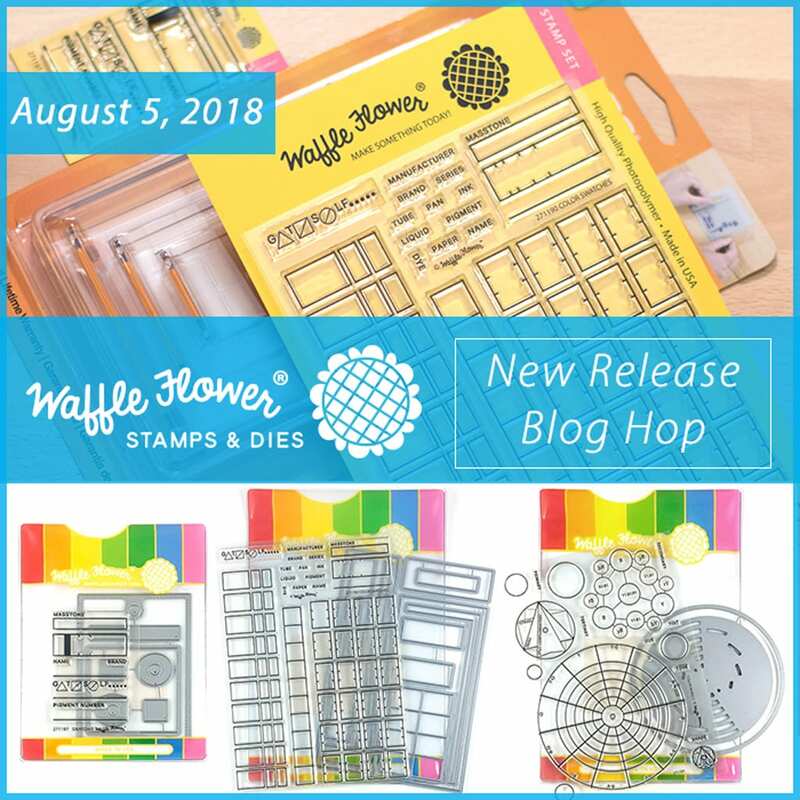 Waffle Flowers have videos with detailed instructions here, and I highly recommend taking a look as I can’t even begin to cover a fraction of the possibilities these new products have. I’ll show each of the new sets and one way I chose to use them with my supplies. I picked out my Daniel Smith watercolours to use in each example. So starting with the Color Wheels and this set has lots of options for ways to create a colour wheel from three primary colours. I chose to use Daniel Smith Quinacridone Rose as my red, Daniel Smith Cerulean Blue Chromium for my blue and Daniel Smith Hansa Yellow Light for my yellow. I stamped the colour wheel in Versafine Onyx Black ink on Arches Hot Pressed watercolour card (smooth for the optimum stamped impression) and die cut with the matching die. I painted the full strength value for the three primary colours at the outer ring for each colour segment and then blended the colour out to the lightest value towards the centre. 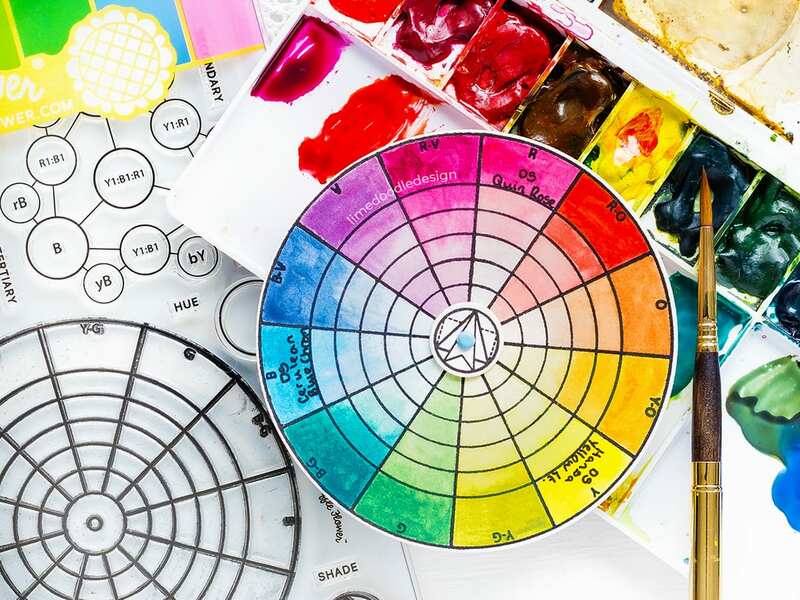 This method creates a simple colour wheel based on the value of each colour – adding more water lightens the colour. Alternatively, you could use the colour wheel to explore tone by adding grey or shades by adding black. I then started mixing two primary colours to get the secondary colours – for example, red + yellow = orange and painting that colour in the relevant segment. I repeated this process to get all three of the secondary colours; orange, green and violet. After which I mixed a primary colour with a secondary colour to get the tertiary colour – red + orange = red/orange. Again, I repeated the process to complete the colour wheel with all six of the tertiary colours; red/orange, yellow/orange, yellow/green, blue/green, blue/violet and red/violet. 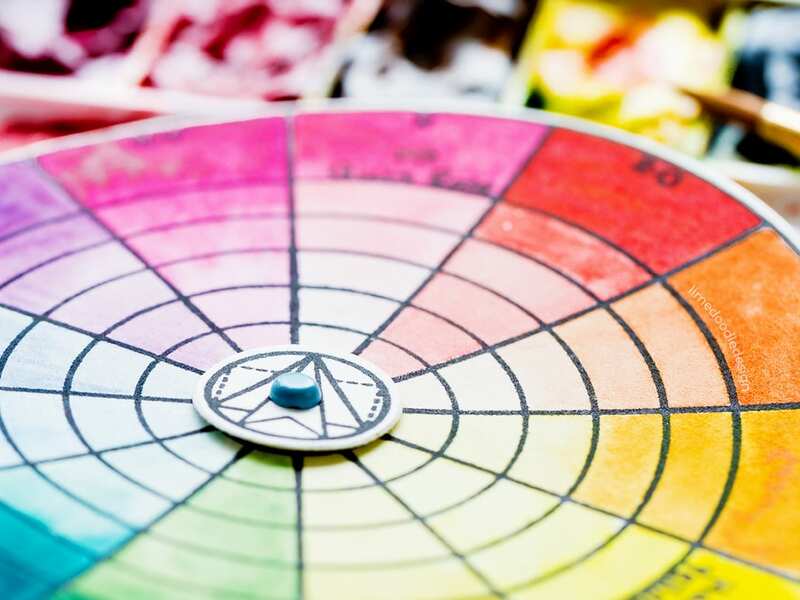 There are a couple of options for the centre of the colour wheel to indicate colour combinations such as a triad, split complementary and tetrad. For example, pointing one tip of the triad at red and the other tips point to the two other primary colours blue and yellow. Whereas if the tip of the complementary triangle is pointed at red, then the other two tips point to the split complementary colours (those either side of the complementary colour). In this case, the complementary colour, that opposite red on the colour wheel, is green and the split complementary colours are yellow/green and blue/green. I chose to stamp the smaller centre so that most of the colour wheel was still visible. I stamped the centre in Versafine Onyx Black ink and then die cut with a circle die before attaching to the colour wheel with a brad from my stash. Boy, it’s been a while since I used a brad! 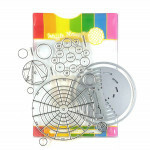 Moving on to the Swatch set and this has lots of options for swatching out your supplies. 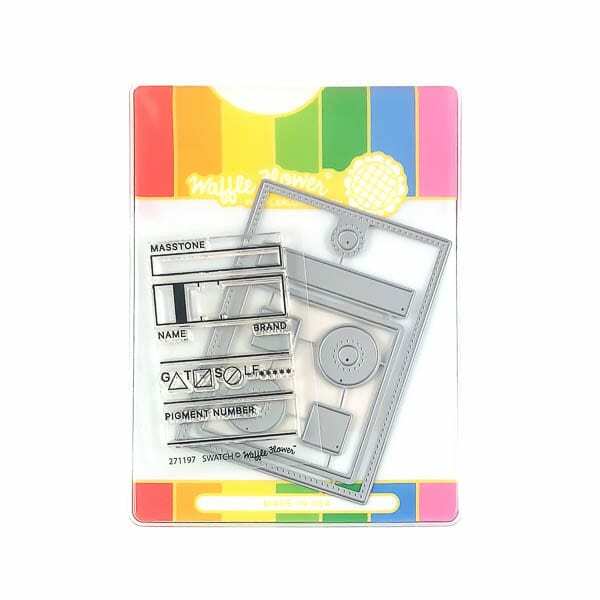 There’s an ATC sized tag die which fits the whole stamp nicely or equally a 2×2 die perfect for those of us who like to swatch our supplies and store them in stamp pockets. 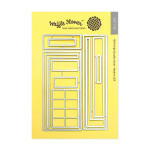 With the 2×2 option, you can pick which parts of the stamp set are most important to you and stamp just those sections. 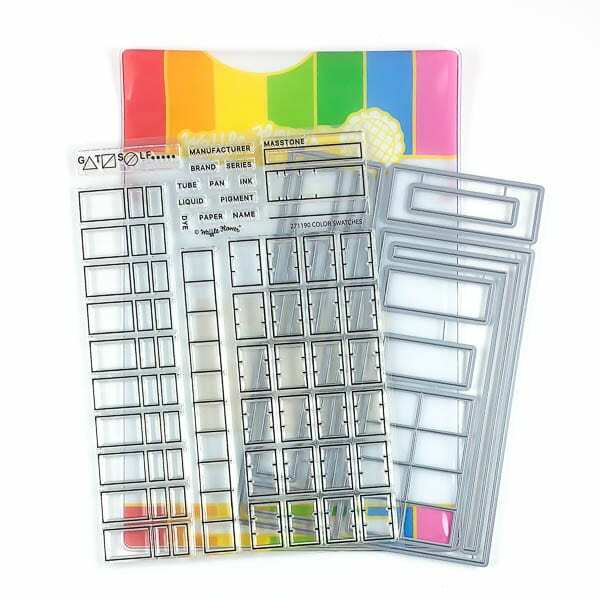 I plan to swatch out my liquid watercolours at some point, and for those, I intend to use just the masstone (full strength), swatch, name and brand sections which would fit perfectly on the 2×2 size. 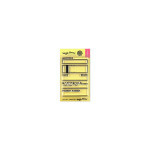 swatch rectangle to paint the full strength colour fading to the lightest value. The addition of the thick black line allows for the transparency of a colour to be determined. If a colour is transparent, the black line will be unaltered after the colour is painted over it. 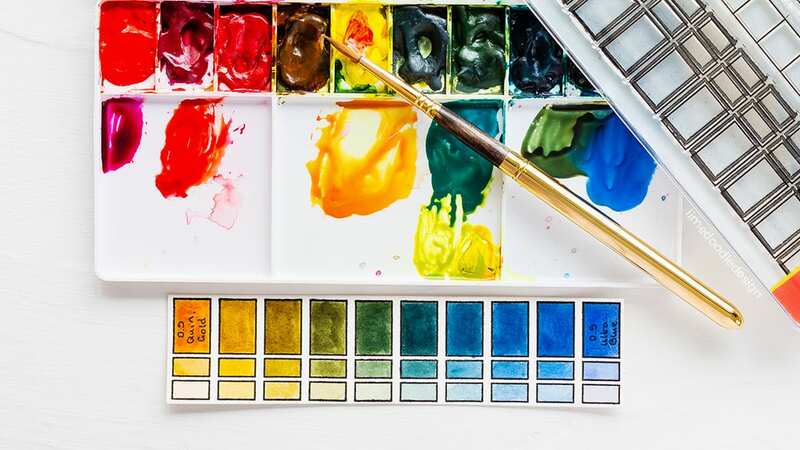 However, if the colour is semi-transparent or opaque, then the black line will be altered after painting with a milky film from the pigments in the paint. G triangle to indicate whether a paint granulates. Granulating pigments settle into the valleys of textured paper to give a grainy appearance. This is a property of some watercolours which you either love and want to incorporate or dislike and want to avoid. If paint is granulating I filled in the triangle with a black pen. T square. Transparency as mentioned above in the swatch rectangle section, paints can be transparent, semi-opaque or opaque and this square allows for recording this by leaving the square unmarked for transparent, filling half the square for semi-opaque and filling the square completely for opaque. S circle. Paints can stain the paper and be difficult to lift by adding water or scrubbing with a brush. The circle allows for recording the staining properties. For Daniel Smith paints, staining is recorded on a scale of 1 – 4 where 1 is non-staining, and 4 is staining. I coloured in quarter segments of the circle to indicate the staining property of each paint. LF stars for lightfastness. Lightfastness is a determination of how much a paint colour will fade when exposed to light. 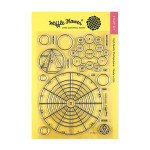 This is very important for pieces of artwork hanging on a wall, but probably less relevant for card making. However, I’d still like to think that the cards I send my Mum and she keeps will retain their colour for years to come. Daniel Smith watercolours are rated on a scale of 1* excellent (100+ years), 2* (100 years) 3* fair (50-70 years) and 4* fugitive (15-20 years). I marked circled the relevant star for each colour. Pigment number. 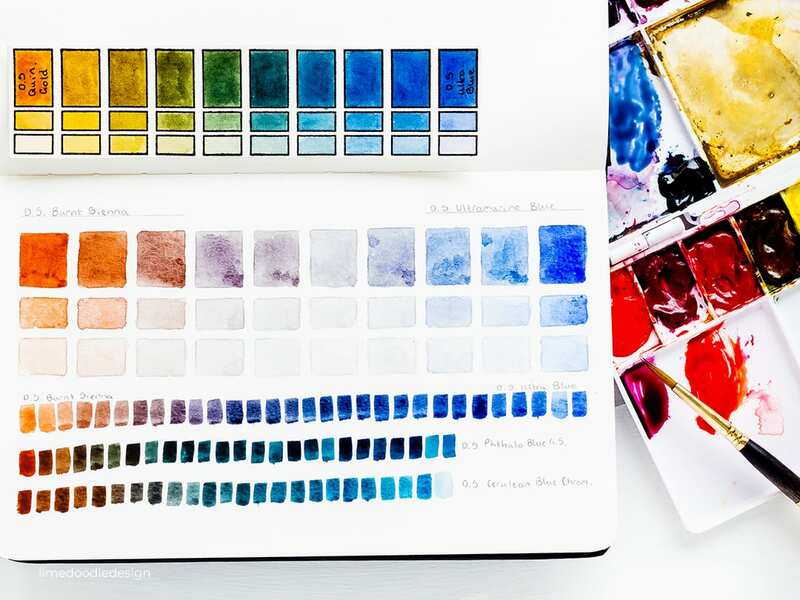 Watercolours are made from different pigments each of which has a number. 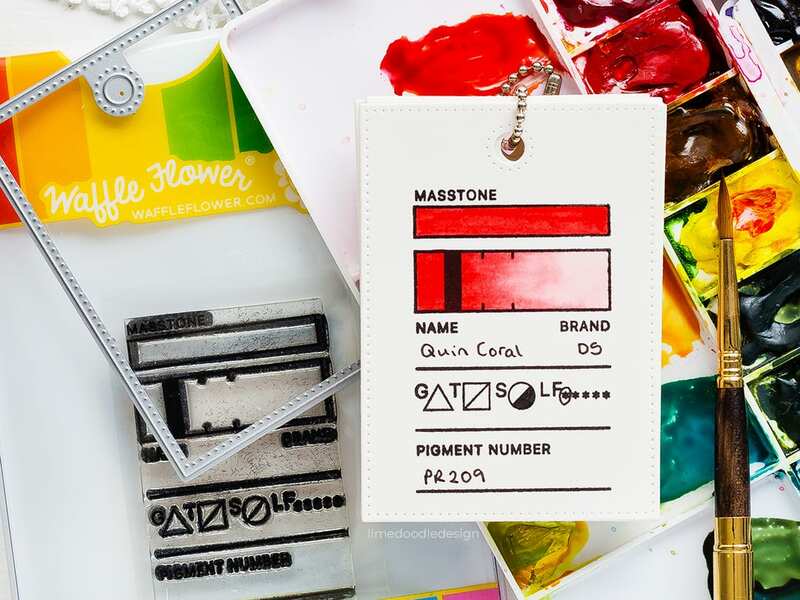 The pigment numbers allow you to determine similar colours from different manufacturers and also how certain pigments are combined to create convenience paint colours. For example, my favourite Undersea Green is a mixture of PB29 (French Ultramarine), PO48 (Quinacridone Burnt Orange) and PY150 (Nickel Azo Yellow) and if you had those paints, you could mix your own Undersea Green. However, I love this green and so am happy to make a space in my palette for it even though I could mix it myself. As such, pigment colours allow for a fuller understanding of each paint colour. 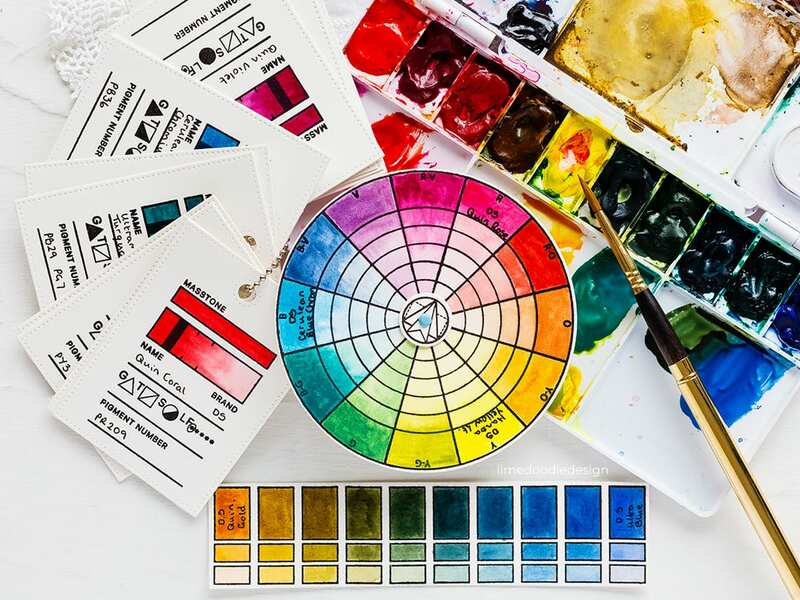 For Daniel Smith watercolours, you can find all the details of the paint properties on their colour chart here. Finally, let us take a look at the Color Swatches set. Again, I recommend watching the video to see the full potential of this set. Within the set moving from left to right are charts for colour mixing, value studies and swatch grids. Above the charts are label information (top left) and a single swatch (top right) similar to those found in the Swatch set and perfect for creating 2×2 swatches. I chose to use the colour mixing chart. The aim of this chart is to indicate a few of the possibilities when two colours are mixed. I chose to use Daniel Smith Quinacridone Gold on the left and Daniel Smith Ultramarine Blue on the right. You paint the full strength colour in the large rectangle and diluted values in the two rectangles below for each colour. Between the Quinacridone Gold on the left and the Ultramarine Blue on the right are 8 other sections and the aim is to mix the two colours, initially mixing mainly Quinacridone Gold with a touch of Ultramarine Blue and paint that in the section column. You work your way along until the middle colours are more of a one to one mix and then finally working your way along until you mainly have Ultramarine Blue with just a touch of Quinacridone Gold. I love testing out colour mixes this way and revealing the wide range of hues from just two colours. I have been exploring colour combinations in this way for a while in line with Jane Blundell’s watercolour mixing charts. I bought a sketchbook and would pencil in the boxes, and this would take time. Underneath I’d explore other combinations and my lines would be wonky! Believe me, that upsets my neat and tidy tendencies! 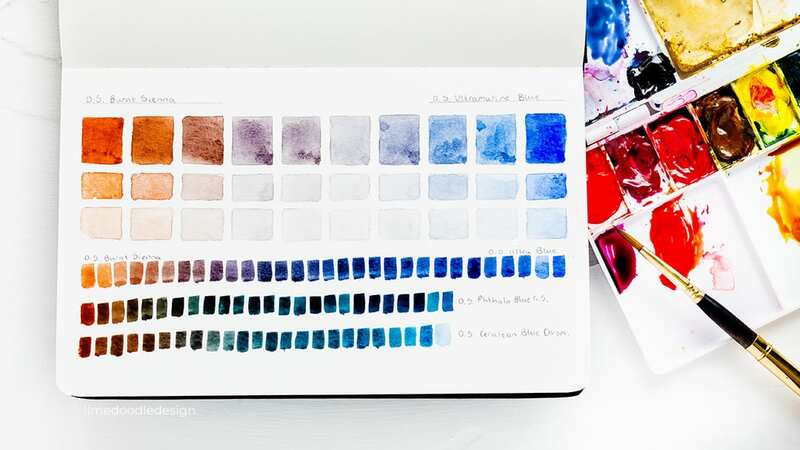 You can pick your favourite watercolour paper to stamp your chart on and so truly explore the watercolours on a medium you are going to use. A lot of sketchbooks aren’t made from quality watercolour paper. Stamp, paint, and if you make a mistake, you can start again and so everything is kept neat and tidy, and you only adhere swatches which you want to keep. Well done if you have made it this far! 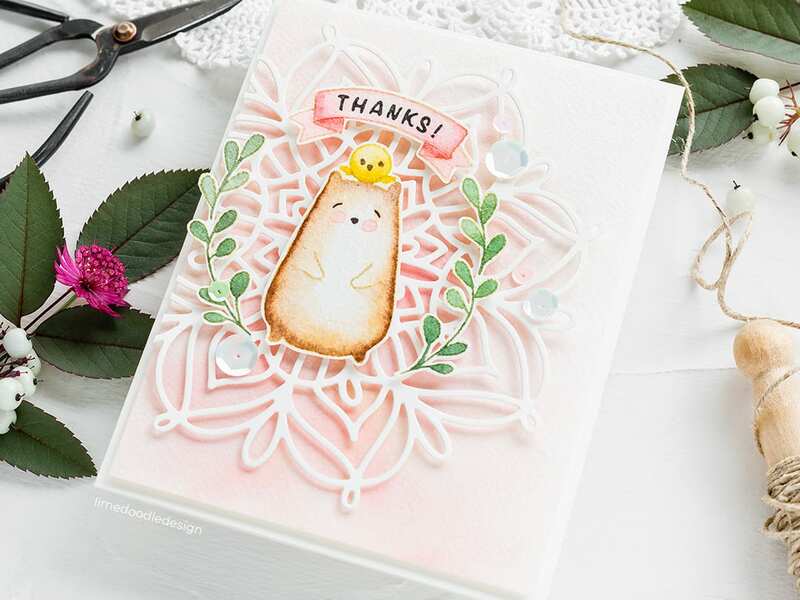 For those of you not interested in swatching here’s a card I made using the new Lacy Flower XL die to add an elegant background to the Big Bear & Bird set. I stamped the bear and bird image along with the two leaf sprigs on Arches Cold Pressed watercolour card with Antique Linen Distress Ink and watercoloured with Daniel Smith paints. For the sentiment, I stamped the banner from the Big Bear & Bird set again with Antique Linen ink and watercoloured before stamping the sentiment in Versafine Onyx Black ink. I die cut the Lacy Flower XL die from Ivory card and foam adhered it over a panel of watercolour card I had lightly watercoloured a pink wash. 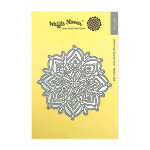 I then foam mounted the watercoloured elements on top of the Lacy Flower XL die. I love the dimension you get from adhering the elements with foam adhesive. Finally, I accented the card with Butterfly Kisses sequins. 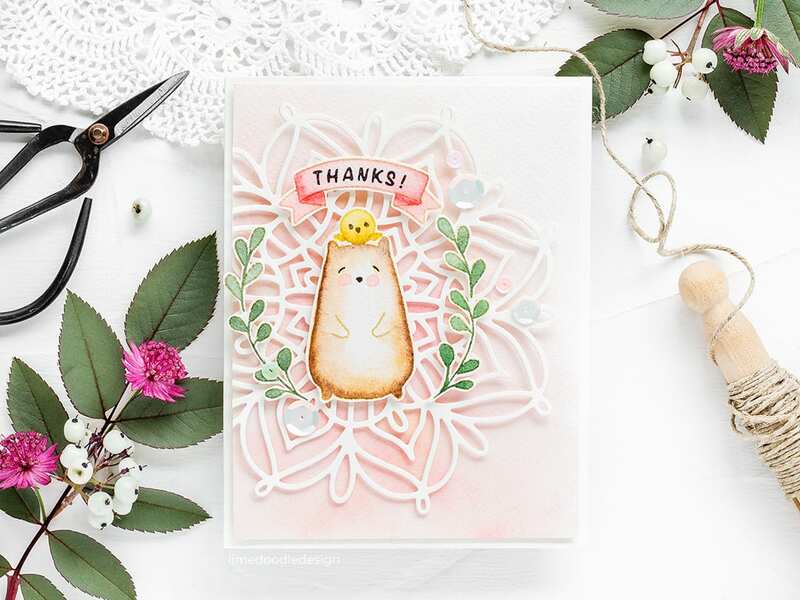 I hope you’ve enjoyed this look at the new colour swatching sets from Waffle Flower Crafts along with the new Lacy Flower XL die. You can find all the new products here. As mentioned above, today’s post is part of a blog hop to explore and provide inspiration for the new Waffle Flower release. Hopefully, you’ve arrived here from Nichol Spohr’s blog, but if not then a good place to start is the Waffle Flower blog. To celebrate the blog hop, Waffle Flower is giving away $25 gift certificates to THREE lucky winners. You can leave a comment on my blog and along the hop by 11:59 pm ET on 8/12/18 for your chances to win. Winners will be chosen at random from the comments left on any of the posts on this blog hop and will be announced on the Waffle Flower blog on 8/15/2018. 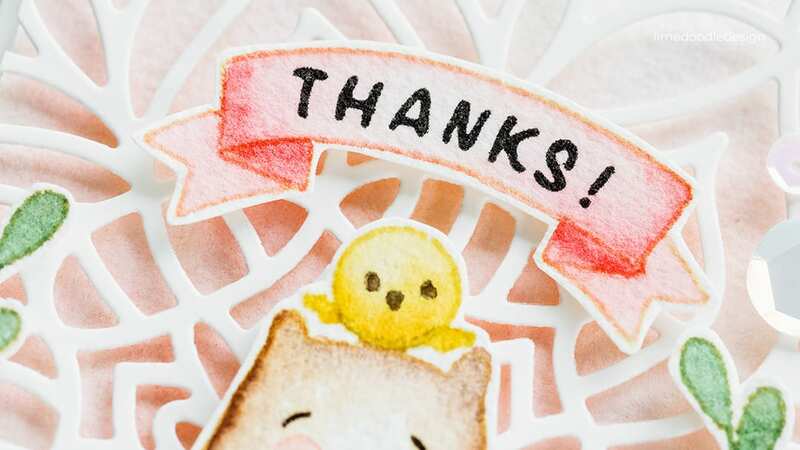 Love the sweet Big Bear and Bird card! 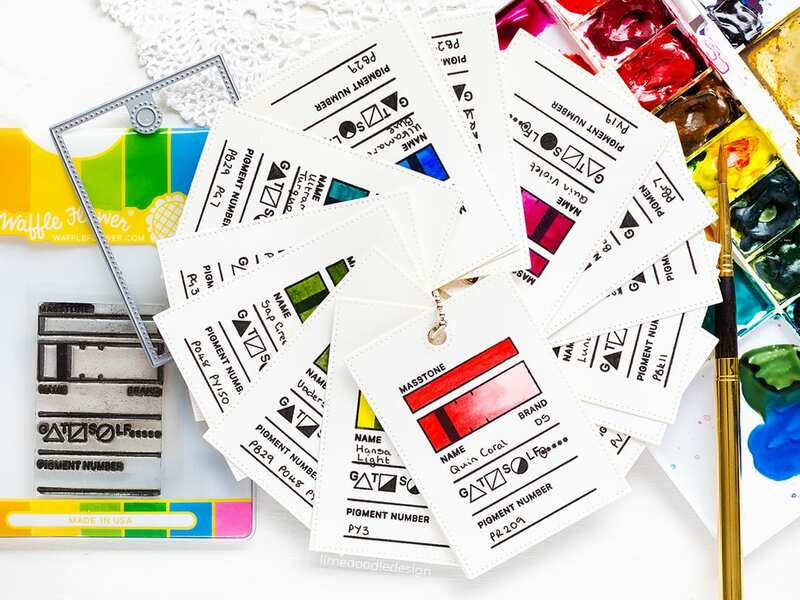 And, these color swatching stamps will be very handy-brilliant idea! 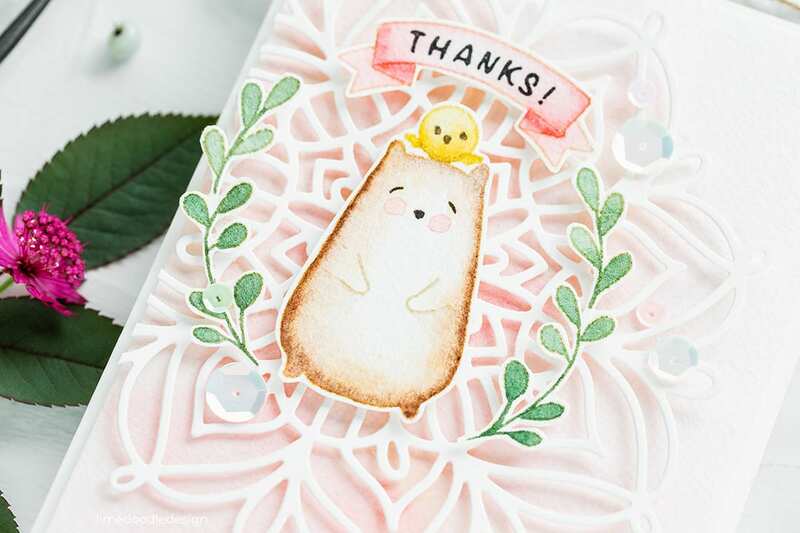 Your card is so cute with these sweet friends. Thanks for the inspiration. You can learn so much by swatching and creating mixed color charts. These sets are helpful tools to streamline the process. Wow ! Thank you Debby for this great post. Very complete.